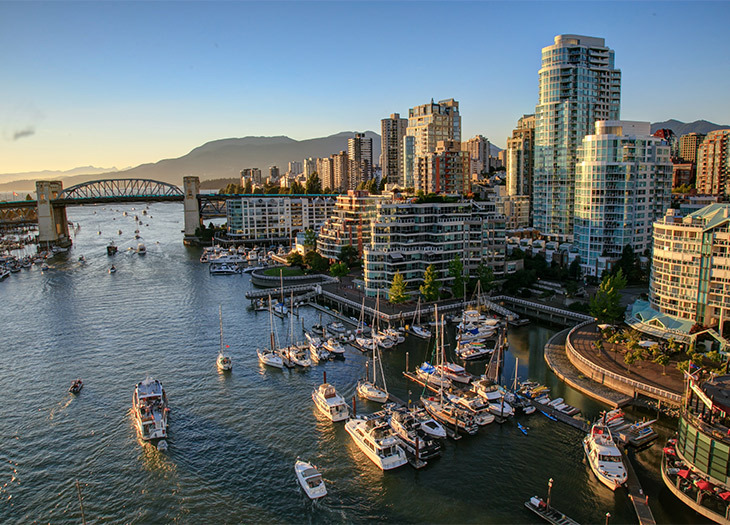 Nestled on the Pacific Coast, Vancouver, B.C., consistently ranks among the top five most desirable places to live in the world – hardly surprising when you consider the stunning location, laid-back atmosphere, and cosmopolitan populace. It’s a pretty awesome place to visit, too. And that’s true, any time of year. “Vancouver is a multicultural, accessible, clean, friendly city that is often overlooked,” says Idaho-based Virtuoso travel advisor Katie Schmit. Canada’s third-largest city boasts a mild climate and easy access to postcard-perfect ocean and mountains where outdoor enthusiasts can take advantage of an endless array of hiking, biking, kayaking, snowshoeing, and skiing, including perennial favorite night skiing. With these conditions, every season has its reasons. It rarely snows in the city (the white stuff stays up on the mountains) and temperatures are the mildest in Canada. All of which makes it possible to enjoy a walk downtown along the seawall or a stroll in the temperate rain forest, even in the dead of winter. Bars and restaurants have figured out that if they build it (a winter patio, that is) you will come. And you will stay, provided there are plenty of creature comforts that turn up the heat. Set on the fourth floor of Rosewood Hotel Georgia, Reflections is a chic spot to spend an afternoon sipping handcrafted cocktails by a firepit. Downtown steakhouse Black & Blue keeps the good times rolling no matter the weather, thanks to an expandable roof over the patio. Relax on comfy sofas arranged around individual hearths, while a glass fireplace wall reveals peekaboo views of the city’s high-rises. The winter terrace at Reflections brings good cheer. “Vancouver’s food and cocktail scene is robust,” says Houston-based Virtuoso advisor Susan Butler. “Chefs and bartenders put creative spins on traditional drinks using hard-to-find ingredients that take inventiveness to a new level.” Come in late January to savor it all during Dine Out. The 17-day food and drink festival – the country’s largest – offers culinary experiences, guided dining adventures, neighborhood food tours, and guest chef dinners at some of the city’s best spots. The party continues in February, when Vancouver’s large Asian population and visitors alike turn out for the Lunar New Year lion dances, paper lantern displays, and more festivities that celebrate ancient traditions. Just 20 minutes from downtown is Capilano Suspension Bridge Park, a 27-acre park that holds the iconic bridge (a favorite with Instagrammers) and a series of connected treetop viewing platforms where you can venture from one century-old Douglas fir tree to another. The rain forest, the canyon, and the bridges twinkle with thousands of festive lights through January during the Canyon Lights, a winter illumination festival. Capilano Suspension Bridge Park is stunning in any weather. Only minutes farther afield, Grouse Mountain offers snow lovers the full winter-fun spectrum – from skiing and snowboarding (daytime and nighttime) to ziplining through the forest to mountaintop skating and snowshoeing (best when paired with après snowshoeing fondue). You can practically reach out and touch Vancouver from the slopes of Grouse Mountain. Come springtime, the cherry tree canopies along parks and avenues across the city blossom with delicate pink flowers. Partake in guided tours and organized bike rides to visit illuminated parks and enjoy free performances, concerts, and other events that take place during the Cherry Blossom Festival in April. As the seasons change, many Vancouverites skip the gym and instead head 15 minutes out of town to Grouse Mountain to do Mother Nature’s Stairmaster. The Grouse Grind is a 1.8-mile trail up the face of the mountain that features a breathtaking (literally) 852-meter elevation gain – that’s 2,830 steps for those who like to keep track. See all of Vancouver from the air during a floatplane tour. There’s no better vantage point for taking in Vancouver’s skyline of glass towers and mountains than from the water – and no more charming way to do it than by False Creek Ferry or Aquabus, the rainbow-colored ferry system that links passengers to sights and neighborhoods along False Creek, a short inlet that separates downtown from the rest of the city. For a more active adventure on the water right across from downtown, head to Granville Island or Olympic Village to rent a kayak or stand-up paddleboard and set out to explore on your own or on a guided tour. As summer nights stay light later – until past 10 PM in peak summer months – a well-heeled crowd spills out from restaurant patios and bars into pretty tree-lined streets, parks, and beaches. Arguably the highlight of summer is the Honda Celebration of Light, which features live music and spectacular fireworks displays by dozens of countries over the course of three weekends. Another must-do in the city is a visit to the Museum of Anthropology at the University of British Columbia, which showcases thousands of archaeological and ethnographic objects from around the globe, and particularly from First Nations communities. Don’t miss the beautifully landscaped grounds, where indigenous plants and grasses surround ten full-scale totem poles. Nearby, Pacific Spirit Regional Park features more than 1,800 acres of protected forest and a network of trails popular with mountain bikers and hikers with kids or dogs in tow. It’s easy to enjoy a summer sunset in Vancouver. “The mild climate makes fall a perfect time for exploring the gardens, parks, or activities like whale-watching,” Schmit says. She recommends a visit to Stanley Park, the largest urban park in North America, with beaches, public gardens, and woodlands featuring dozens of trails surrounded by century-old firs, cedars, and hemlock trees. Located next to the downtown core, Stanley Park feels miles away from the hustle and bustle of the city. Look up and you might spot a bald eagle soaring through the sky. For eye candy of a different sort, take in the Vancouver International Film Festival, which presents a lineup of more than 300 films, creator talks with industry leaders, immersive exhibitions, and live music performances that take place at cinemas and auditoriums across the city. With so much to do in Vancouver, the question isn’t when to visit but how long to stay so you can do as much as possible. Virtuoso travel advisors recommend at least three to four days to really get a feel for this vibrant city on the edge of the Pacific, which also makes it a perfect preamble or follow-up to an Alaska cruise. A walk along the Stanley Park seawall is a great way to stretch your legs before or after a cruise. Also, bring your walking shoes. Vancouver has been named Canada’s most walkable city for the past two years. “You could walk from one attraction to another without ever needing to step inside a car the entire time that you are in Vancouver,” Zurbin-Hothersall says. Added bonus: Virtuoso’s five properties in the city – Fairmont Waterfront, Fairmont Pacific Rim, Wedgewood Hotel & Spa, Rosewood Hotel Georgia, and Shangri-La Hotel, Vancouver – all offer centrally located bases for exploring. Learn more about Vancouver events. This article is sponsored by Tourism Vancouver. Photos courtesy of Tourism Vancouver. Ask the Advisors: What's Your Favorite Island Escape?